Thanks for checking out my Trading Card page. Below I list the various cards I have for sale. All my cards are in mint/near mint condition. If you see anything you're interested in, just email me at schew@interzone.com. You can jump to the cards you're most interested in, or just page down to see all of them. If your order is $100 or more, shipping is free. If your order is $200 or more, I'll give you 5% off your total cost (along with free shipping). If your order is $300 or more, I'll give you 10% off your total cost plus free shipping. These discounts do not apply to pre-orders or to autograph cards. Go Back to our home page. 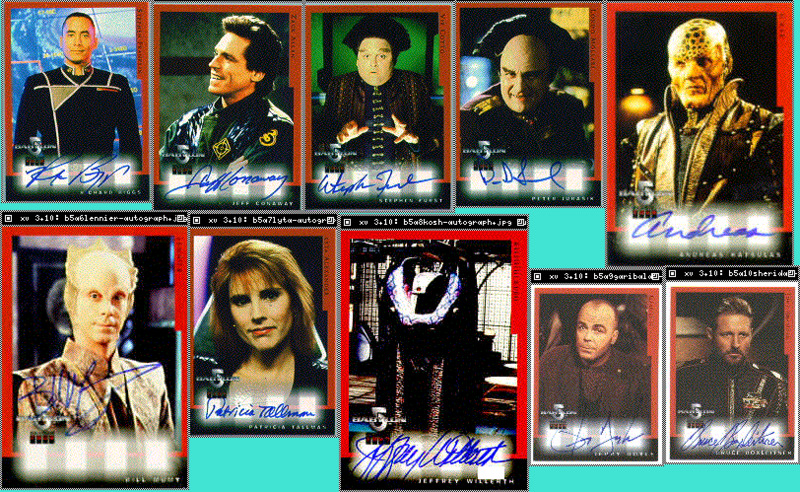 Autograph cards -- I have quite a few Season 5 autograph cards remaining, including Bruce Boxleitner. Send an email for a full list. Send me email if you have questions or want to reserve your set. I reserve sets on a first come first served basis. If you see any cards you're interested in, just send me email me at schew@interzone.com. Here is a picture of all of the autograph cards (sold out): view this jpg. If you're interested in getting any of the sets below, just send me email (schew@interzone.com). Shipping + Insurance (which includes a plastic case for the cards) is extra. The shipping cost will depend on the number of cards you get and your location. so they'll go in the order that I receive your emails. Thanks! the Earth Alliance", "Ships of the Shadow War", and "Babylon 5 Perspectives". If you're interested or have any questions, just send email to schew@interzone.com. $4 per set if you buy more than one set. All collected in a Millennium Falcon replica suitable for display.